I love cookie cutters. There's just something exciting about them. Maybe it's because they remind me of momma a little bit, I'm not sure. There are so many different ones out there. Most cutters are fairly inexpensive, but some of them can be quite costly. If you're not careful though you'll be broke in a matter of months.......or if you're as OCD as me and need them all, in a matter of days or weeks. One of the blogs I read every day is The Sweet Adventures of SugarBelle. The blog writers name is Calley and she really has a fantastic eye for things. She will take a simple cookie cutter intended for one thing and make something totally different. One example is her gumball machine cookies. Truly amazing. I've made many of Calley's cookies. I've even made quite a few on my own, but as they intended to be. If its a bat cutter I make a bat, an owl I make an owl, etc. This time I decided to try something new, to do something different. I needed to use my cookie cutter for a cookie that it wasn't intended for. After all.....It's what all the cool kids are doing. It couldn't be too hard right? Like making out pictures with the clouds right? Well...it was harder than I thought. After a bit of searching through my cutters.......four hours later......a light bulb went off. My light bulb takes a bit longer than most to go off.....I'm slow. I took my copper ice cream cone cutter and made a witch. I know it's not extremely creative, but hey I'm new to this. I gotta start somewhere right? Maybe one day I'll be as creative as all the cool kids but for now you get a witch from an ice cream. First cut, bake, and cool your cookies on a wired rack. After cookies are cooled pipe outline of hat in black royal icing with a #2 tip. Thin out some of the black royal icing. I normally use about a 10 second icing for this. Meaning, when you let the icing fall back into itself it takes 10 seconds until it's smooth again. Fill in hat with the 10 second icing. While the black icing is still wet I piped three rows of 10 second icing in white on top of the hat. Next fill in witch's face with green flood icing. Allow to dry for an hour or two. Next I piped the first layer of squiggly lines for the witch's hair with royal icing. Let the hair dry for about an hour. After that dried I piped a second layer of hair, filling in the empty spaces and giving it a more 3D look. Then I piped on the face. I messed up on the eyes as shown below. Somehow I didn't fill in the entire eye white.....so after it was dried I used a toothpick to remove the center part of the eye and filled in with white then black dots for the pupils. I added a purple band around hat after it was dry, but totally forgot to take a picture....Hey I can't remember everything. After the cookie has dried overnight display on a black background with some Halloween spider web decorations......Just like the cool girls do and take a pretty picture. Hope you enjoyed the tutorial. Please leave loving, good job, pat on the back comments because its the nice thing to do......You know your momma would want you to. Honestly, I am absolutely in love with your blog, and I check it as often as I can. These cookies look delicious! Your attention to detail is incredible. I do have a question though, when you mention "flood icing" what is that?? Flood icing is thinned out royal icing. When you pipe it inside the outline it will flood the cookie to the outline. I'll do a tutorial on that for tomorrow. I like these cookies. I'm a cookie cutter person, too. I like to have cookie cutters specifically made for whatever I'm going to make. I know it seems like all the cool kids are making cookies out of cookie cutters they weren't intended for, but I've always been a bit of a nerd anyway... That's just me. So you're not alone. That being said, you did a really good job with these cookies!! I love your blog! Thanks! I just love making cookies, cakes, cupcakes.....I'm constantly in the kitchen. It's lots of fun just to see the excitement on my children's faces when the see what I made them for the day. Looking forward to your tutorial on flood icing. I would LOVE to see a tutorial on the Pokie Knot flower cookies. . . .with ladybugs. Could you possibly do one for those? These are so freakin' cute!!! And totally creative. Don't sell your talent short. Now, where did you find that cutter? I think I need to try these. SO CUTE! I would never have the patience to make this myself, but these are so impressive! Love them. 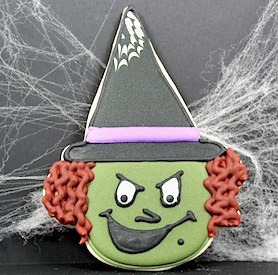 I love your gorgeous witchy cookies! They look store bought. Well done!! @Maria.....cookie cutter was purchased from Dillards.